Cold War political cartoons provide invaluable insight into America's past, present, and future. Studying Cold War political cartoons allows one to see how America sees itself in the ways in which it identifies its own mirror double in the Soviet Union. In US criticism of the USSR, we discover America's own insecurities and the lengths to which it would go to shield itself from introspection. 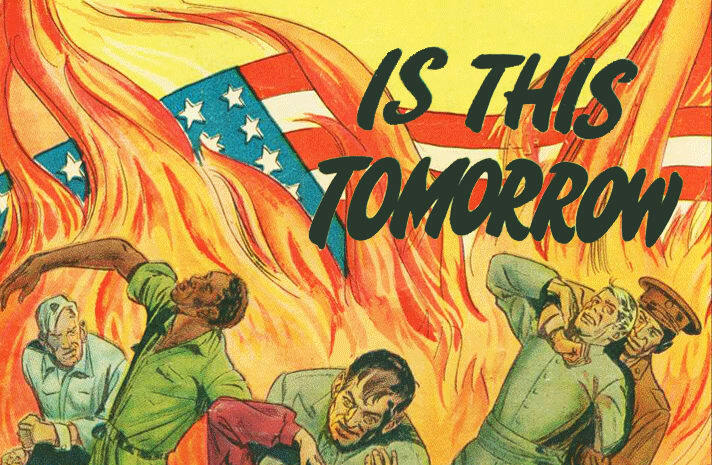 Across these ten Cold War political cartoons, you'll be able to see how it's only under the guise of exceptionalism that America can justify aspirations that are otherwise indistinguishable from that of its foe. What makes this a great cold war political cartoon is the parallel we can observe between the USSR and the USA. Both are trying to extend their political influence, both appear larger than life to the other, and both see each other in opposition. It's important to note their similarities because both nations had domestic policies ripe with human rights violations. America still suffered from systemic racism during the Cold War era. The wealthy getting tax exemptions while the rest of America does the work that makes them rich is nothing new. A frequent criticism of the USSR is that party elites prospered at the expense of the population, but what Cold War political cartoons like this make clear is that same criticism described the United States just as aptly. The Marshall plan was America's plan to provide aid to Western European nations to rebuild after the second World War. The hope was to stop the spread of Communism since the USSR was also offering to help nations, including those outside of Western Europe, transition into a post-colonial world order. Take note of the recurring theme of ways in which the USA and the USSR commit the same acts. Also, check out Stalin's well defined arms. It's a generous rendering! Cold War political cartoons had more than just the literal Cold War to comment on. The US and Russia had plenty of proxy conflicts in play as well. Chief among them was the Vietnam War. When the Pentagon Papers were published, what the American people learned was that they'd been lied to by the government about the prospects of winning the Vietnam War. Administration after administration was sending soldiers into a conflict that could not be won. As one would expect, the Pentagon Papers only served to embolden the anti-war movement. Many Cold War political cartoons portrayed the Soviet Union as a greater threat than it was. Russia, unlike America, fought the second world war on its own land. There were millions of casualties, countless injured, and unspeakable destruction of property. That trauma was then internalized for generations to come. White Americans, meanwhile, returned to a nation that rewarded their service with affordable education and housing (black service men, due to racism, were unable to enjoy the same benefits as white soldiers). America was booming! And Cold War fears were a money maker in and of themselves. In truth, the USSR simply was not the threat the US made it out to be. Mutual nuclear destruction was so often the subject of Cold War political cartoons that it was cliché. It was an every present fear, with many people who were raised during the era having distinct memories of duck and cover drills. And, unfortunately, knowing how to deal with nuclear fallout has not become any less relevant despite the end of the Cold War. 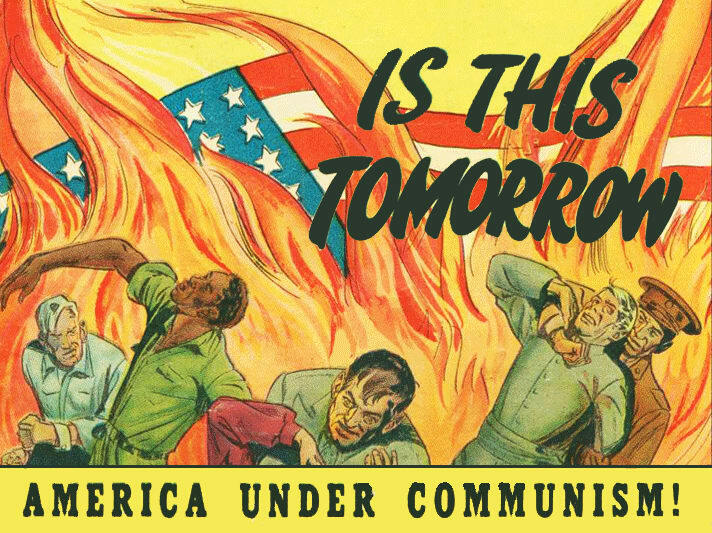 America is aflame when the Communists take over; except the depiction of struggle in this classic image is between Americans themselves. The white guy slugging the black guy is a taste of America's racist policies and attitudes, and the soldier dragging away the white man is a reminder of America's embroilment in Vietnam. The unintended effect, then, is that the fear of Communism is extraneous to America's predicaments. Trying to lift the Iron Curtain is a frequent motif of Cold War political cartoons. In this particular image, the UN is taking a shot at it while the US and France observe. The problem with this image is that it takes for granted the toxic masculinity that drives so much of America's behavior. The United Nations, an inherently cooperative organization, stands in juxtaposition to America's unilateral approach. This is reflected in the gender dynamics in the image. While it's possible to read the fall of the Soviet Union as the story of the United States unwavering war of attrition finally succeeding, America's victory rings hollow given American failure to address its own ills. Racism, poverty, endless wars, and crumbling infrastructure have been plaguing America for decades. The Cold War may be over but the struggle for America's soul is seemingly never ending. That Vietnam was a quagmire was commonly agreed upon. In fact, talking about Vietnam (and later Iraq) is how most Americans learn that "quagmire" is even a word. In this image, a politician finds himself chasing a Vietnam exit that is always out of reach. The drawing has the additional effect of conjuring the the famous photo of the young Vietnamese girl fleeing napalm. In this case, the politician is able to pursue his foreign policy goals in the comfort of his suit. Irrespective of the result, the politician remains unscathed. The same cannot be said of American soldiers or the citizens of Vietnam. Defanging Castro with an embargo was America's foreign policy approach to Cuba for decades. It was also a recurring subject in Cold War political cartoons. Cuba's right next to America, so it makes sense for America to be concerned about the island nation's intentions. But if what makes the island nation of such concern to America is the potential threat that it may pose it begs the question: what is a country as purportedly powerful as America so afraid of? The answer is that America has always been more interested in empire than utopia. And it's this tension that continuously undermines America in the same way that it undermined the Soviet Union. The hope is that America, for the sake of the world, changes course. I’ve read so many self-help books I took the Hippocratic Oath. Creativity guru and SJW.